The word handiwork is interesting to me. We sometimes use it negatively, “That mess is the handiwork of the boys.” but usually, handiwork is a good thing. It is a project that was done by hand. It doesn’t happen automatically. It’s not machine-made. Handiwork has to be made by hand. If we are God’s handiwork, what does that mean about us? I’m currently in a Bible Study called, “Unglued” by Lysa Terkeurst. In it, this week she talked about us being God’s handiwork (or workmanship). 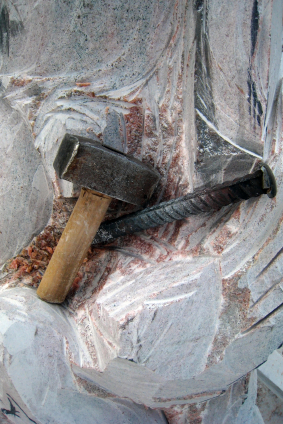 She suggests that we should, “Let God Chisel”. Comparing us to the statue of David, she explains that God sees who we are meant to be, even when that shape hasn’t fully formed yet. I love the idea that God is continuing to shape me, especially at times when I am reminded I have so far to go. One of the things that separate handiwork from other products or creations is the attention to detail. When you are making something, whether it’s a cake, a painting or a craft, you’re intimately involved in the process. You have an idea of how you want that project to end up. You know what your vision is for that item. God is the same with us. He sees us in our present state, but He knows there is so much more we could be. He has a vision for us. He has a plan for us, a plan to prosper us and not to harm us (Jeremiah 29:10-12). Sometimes we’re stuck. We don’t want to change, and the Lord has to chisel away to get rid of what is holding us back from being all he imagined for us. We have the opportunity to be what God envisions, because of Christ Jesus. Left on our own, we would be hopeless slabs of marble. Jesus’ sacrifice on the cross allows us to be chiseled by God, transformed into His image, continually changing to be more like Him. When you see a painting or sculpture by an artist, you may be able to tell who made it, just by looking at it. The same can be said in architecture, writing, and even cooking. When something is created personally, crafted into something new, there is a mark of the one who made it. There is a signature (sometimes literally) that lets you know who was the creator of this masterpiece. As we are transformed to be more like Christ, we too should be clearly visible as His masterpiece. People should be able to tell that we are Christians. The way we love, the way we argue, the way we serve, in everything we do, by the grace of Jesus Christ, we are able to reflect our Lord, giving Him the glory for all we achieve and all the changes He makes in our life. As we become who He has envisioned, we will become a clearer piece of His handiwork. May we so blessed as to have people say – “Well, you know she’s a Christian, right?” I pray that people can tell that I am the handiwork of the Lord. The product of handiwork – To do good works, which God prepared in advance for us to do. So what are we – the handiwork – supposed to do? How will people be able to tell that we are God’s creation, His masterpiece? The product of His handiwork, us, is to do good works, which God prepared in advance for us to do. He has a purpose for your life. He has a plan. You are more than a work of art for people to look at up on the wall, you’re a living exhibit. You’re an interactive display of Christ on earth. As a Christian, each and every action/reaction we have is a reflection on our Lord. He may still be chiseling away, working on us, but we too should try to be cooperative mediums from which He can create. May we be pliable to the changes the Lord has in store so that we may live as a good reflection of the Artist who created us – God.